Mixed Doubles pairing, Jang Woojin and Cha Hyo Sim, ensure a Unified Korea team presence at the 2018 ITTF World Tour Grand Finals in Incheon. 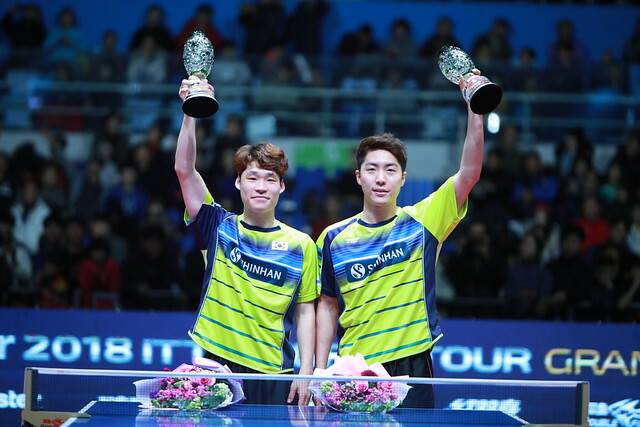 Host nation Korea topped the charts in both Men’s Doubles and Mixed Doubles categories on the 2018 ITTF World Tour. In the former, JEOUNG Youngsik and LEE Sangsu combined to claim the Japanese and Australian Open titles en route to their 919-point haul. LEE Sangsu also formed a winning partnership with JEON Jihee to sit atop the Mixed Doubles standings, triumphing at the Australian Open along the way. The Mixed Doubles have provided arguably the greatest success story of 2018 beyond the realms of table tennis, as JANG Woojin (of South Korea) and CHA Hyo Sim (of North Korea) ensured a Unified Korea team presence in Incheon (as 2nd seeds), five months on from their emotional Korean Open victory. LIM Jonghoon and YANG Haeun (4th) form a third Mixed Doubles pairing from Korea, and both will be representing their country also in the Men’s Doubles and Women’s Doubles respectively alongside the aforementioned JANG Woojin (6th) and JEON Jihee (3rd). A formidable force also in the Doubles scene, Mima ITO celebrated gold four times on the 2018 ITTF World Tour at the German, Australian, Bulgarian and Austrian Opens, meaning she enters the World Tour Grand Finals in a top seed partnership with Hina HAYATA. Japan’s other Women’s Doubles representatives are Honoka HASHIMOTO and Hitomi SATO (7th). ITO will also be competing in the Mixed Doubles alongside Masataka MORIZONO (6th), as fellow Japanese star Kasumi ISHIKAWA accompanies Maharu YOSHUMURA (5th). While China has no Mixed Doubles representatives in Incheon – after their four pairings during the 2018 ITTF World Tour failed to meet requirements by participating in just one tournament each – the country is highly competitive on the Women’s Doubles front, entering three pairings of significant calibre. Of those, CHEN Xingtong and SUN Yingsha (2nd) are the highest ranked after they claimed the Hungarian, Hong Kong and Swedish Open titles. Boosting China’s hopes of glory are also CHEN Ke and WANG Manyu (4th), who celebrated success at the Qatar Open, and LIU Gaoyang and ZHANG Rui (5th), who in turn triumphed at the Czech Open. However, last year’s Women’s Doubles champions, CHEN Meng and ZHU Yuling will not be lining up again this time around after they only managed one tournament apiece, DING Ning their partner on both occasions. 2015 champions in Lisbon, 2016 runners-up in Doha and 2017 champions again in Astana, Masataka MORIZONO and Yuya OSHIMA are aiming for further silverware when they enter the Men’s Doubles competition as 2nd seeds in Incheon. Having gone the whole calendar year without a title, they ended their drought by sealing gold at last week’s Austrian Open in Linz. 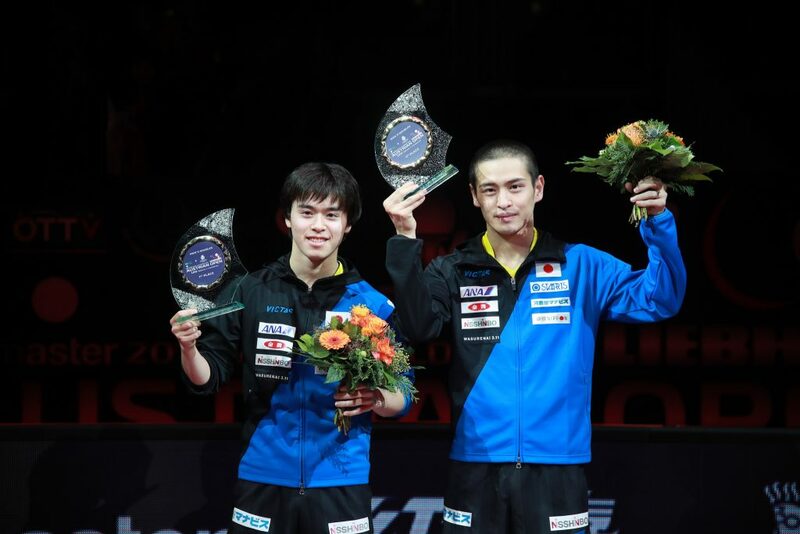 Masataka MORIZONO and Yuya OSHIMA claim the Men’s Doubles title at the 2018 Austrian Open. Their sternest opposition for the end-of-year crown this time – if not from Korea’s JEOUNG Youngsik and LEE Sangsu – will come from 3rd seeds, MA Long and XU Xin. The Chinese stars sealed the spoils at both the German and Bulgarian Opens this year, while the latter also claimed the Qatar Open title, that time alongside FAN Zhendong. WONG Chun Ting and HO Kwan Kit form Hong Kong’s highest candidates as fourth seeds in the Men’s Doubles. The pair combined to win the Hong Kong Open in May. WONG Chun Ting will also be partnering DOO Hoi Kem (6th) in the Mixed Doubles, while Hong Kong has two pairs in the Women’s Doubles: DOO Hoi Kem and LEE Ho Ching (6th) and NG Wing Nam and SOO Wai Yam Minnie (8th). Meanwhile, Chinese Taipei will enter competitive pairings both in the Mixed Doubles – CHEN Chien-An and CHENG I-Ching (3rd), the latter also featuring in the Women’s Singles – and in the Men’s Doubles – LIAO Cheng-Ting and LIN Yun-Ju (5th). The latter pair combined recently to win the Swedish Open. The Men’s Doubles category will see two pairs from Europe this year: Patrick FRANZISKA and Jonathan GROTH enter as 7th seeds in a German-Danish partnership that yielded the Czech Open title, while Mattias FALCK and Kristian KARLSSON will be representing Sweden as 8th seeds, having finished runners-up in the Swedish Open. Patrick Franziska & Jonathan Groth successfully defends their doubles title from last year by beating Mattias Falck & Kristian Karlsson 3-1 in the final at Czech Open! Meanwhile in the Mixed Doubles, Lubomir PISTEJ and Barbora BALAZOVA (8th) will be flying the flag for Slovakia at this year’s World Tour Grand Finals.